Aqua (Water), Caprylic/capric/succinic Triglyceride, Mica, Pentylene Glycol, Polymethyl Methacrylate, Dimethicone, Limnanthes Alba (Meadowfoam) Seed Oil, Dimethicone Peg-7 Phosphate, Trimethylsiloxysilicate, Hydroxyethyl Acrylate/sodium Acryloyldimethyl Taurate Copolymer, Phenoxyethanol, Steareth-21, Squalane, Caprylyl Glycol, Steareth-2, Tocopheryl Acetate, Polysorbate 60, Sodium Stearoyl Glutamate, Butylene Glycol, Sorbitan Isostearate, Sodium Hydroxide. [+/-: Ci 12085 (Red 36, Red 36 Lake), Ci 15850 (Red 6, Red 7, Red 7 Lake), Ci 15985 (Yellow 6, Yellow 6 Lake), Ci 19140 (Yellow 5, Yellow 5 Lake), Ci 42090 (Blue 1 Lake), Ci 45380 (Red 21, Red 21 Lake, Red 22 Lake), Ci 45410 (Red 27, Red 27 Lake, Red 28 Lake), Ci 73360 (Red 30, Red 30 Lake), Ci 77891 (Titanium Dioxide), Ci 77163 (Bismuth Oxychloride), Ci 77491, Ci 77492, Ci 77499 (Iron Oxides), Ci 77742 (Manganese Violet)]. This satiny-pink liquid complexion highlighter accents cheek & brow bones for a dewy, radiant glow. Use as a spot highlighter over makeup or wear under complexion products for subtle luminescence. It's the "supermodel in a bottle!" Dot and blend over makeup on to cheek and brow bones, or anywhere you want to add a touch of radiance. The only highlighter you'll ever need! Although one should be careful whilst applying this highly pigmented product, it's so easy to apply you can't really make a mistake. It gives you that "I'm awake!" glow and shows up wonderfully on camera. Use it with a light hand so as not to pull your foundation off, though, as I find it can attach itself to your makeup very quickly. I find it is too shimmery for use on the brow bone, but love it as a cheekbone and cupid's bow highlight. It's expensive but I swear just doesn't run out! Well worth the money. With my skin being normal/combination, I normally use a powder to highlight, but this is gorgeous. I received a free sample with a purchase from sephora, and I may go back to get the full version! I personally don't think this product is worth the money. First of all it has tons of drugstore alternatives such the "Born to Glow" Liquid Illuminator by NYX and the Facial Whip by ELF. I also don't think this product does that much. I have a sample of it and I personally don't like Illuminating in general. I think there are many cheaper alternatives to this and it is really not worth the money. Love this product and I take it everywhere! This highlighter is awesome and a little goes a long way. It is compact and convenient to use as the applicator is a little brush. Its light and offers just enough shimmer and sheen to finish any application. I like that it is not to heavy and is blend-able. It is a little on the pricey side if you are on a budget but it lasts and is worth it in the end. Highly recommend! Best one there is! and ive tried plenty (mac, stila, lorac) by far Benefit WINS! I love the pinkish undertone, gives that perfect subtle glow. My makeup is not done without this! I love it! This is my first love when it comes to highlighting. I was introduced to this product in my first make up job when I was 18. Six years later, it still one of my top choices when I want to achieve a dewy glow. The consistency is smooth and silky, creamy but lets your skin breathe. Every girl should have this! this is amazing. its a very subtle color of pink which flatters any skin tone. i have extremely pale skin and the soft pink really brings out the colors of my eyes and natural skin pigment. i love alot of benefit products and i have wanted this one for the longest time. i love it so much because it doesnt really require much effort and makes your skin more glowy! 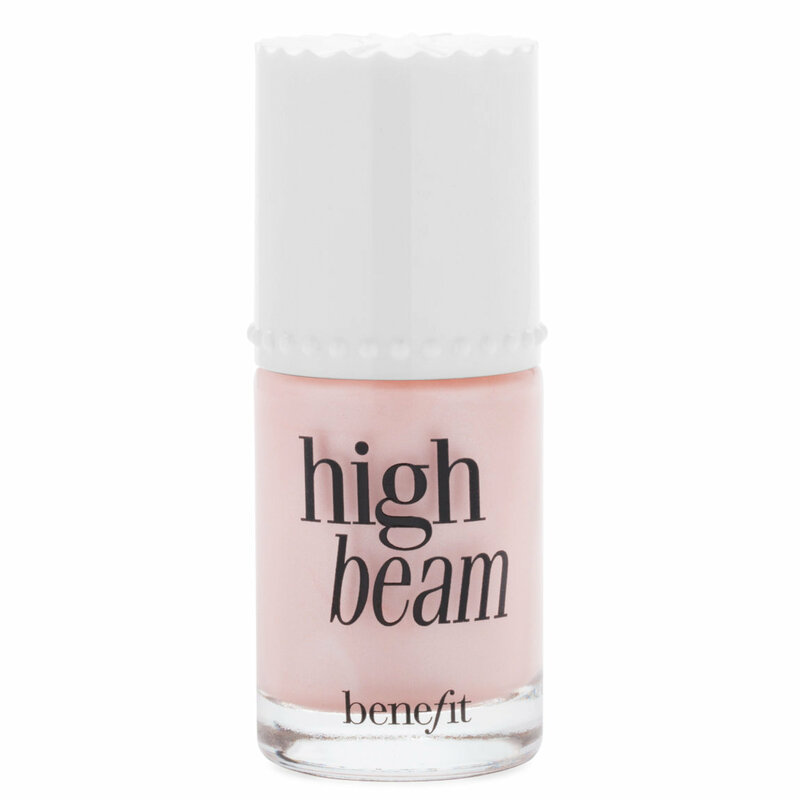 as long as you understand how to use high beam, i think you'll love it too! I will start off by saying I don't use it much anymore because I'm not a face product girl BUT, I've already used half the bottle! I'm not into highlighting but when I got this, it made it SO easy and it was a cool concept for the bottle. It has a brush applicator and is like a nail polish bottle. You don't need much and it gives you the glow people will compliment you on! It really is worth the 25 bucks! It lasts me all of my school day and it doesn't make me look "dried out" like powder highlighters can do. There isn't really a smell. If there is anything to complain about it would be the packaging but even that isn't a biggie with me. Overall, this product is FANTASTIC! Fantastic, if you can use it correctly. I'm a fan of this highlighter - the product itself is gorgeous, warm and luminous, especially on my fair skin. However, the applicator is really, really strange. I'm not sure why they used nail polish for inspiration, but the brush is obviously not the best way to apply it. I've used everything from blending brushes to fingers and sponges, with different results. I would recommend this, but only if you're willing to figure out your own system for using it. If that doesn't sound like your cup of tea, I also have the Benefit "Watt's Up," highlighter, which applies much easier on the first glow, but is more champagne-y than peachy, like this. It's all up to your makeup system!